Menulog delivers for LeWrap - Miranda so you'll be able to track your courier on a map. Grilled strips of chicken breast, lettuce, tomato, onion, red cabbage, carrot, and choice of sauce. Grilled strips of chicken breast, lettuce, tomato, guacamole, mozzarella cheese, and Caesar sauce. 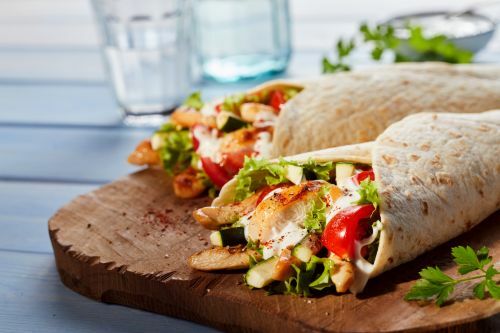 Grilled strips of chicken breast, grilled onion, lettuce, tomato, mozzarella cheese, and sweet chilli sauce. Grilled beef strips, lettuce, tomato, onion, red cabbage, carrot, and choice of sauce. Grilled beef strips, lettuce, guacamole, mozzarella cheese, tomato, salsa, and sour cream. Grilled beef strips, grilled onion, lettuce, tomato, roasted pumpkin, and basil pesto. Grilled mushroom, onion, capsicum, lettuce, tomato, red cabbage, carrot, mozzarella cheese, and choice of sauce. Grilled pumpkin, onion, capsicum, lettuce, feta cheese, carrot, basil pesto, and hummus. Grilled eggplant, mushroom, capsicum, tomato, feta cheese, basil pesto, and hummus. Grilled chicken, grilled mushroom, onion, capsicum, steamed white or brown rice, and side salad with choice of dressing. Beef strips, grilled mushroom, onion, capsicum, steamed white or brown rice, and side salad with choice of dressing. Mixed lettuce, tomato, Spanish onion, red cabbage, carrot, mushroom, capsicum, feta cheese, olives, and choice of dressing. Mozzarella cheese, tortilla chips, guacamole, salsa, sour cream, lettuce, and tomato.